Souleymane Doukara, went closest to a goal for Leeds United. A big Elland Road crowd went home disappointed after seeing Leeds United slip out of the play-off places with a disappointing display and a 1-0 home defeat to Wolves. An awful first half display was at the heart of the defeat as the Whites were lucky not be at least three down at the break despite being roared on by a crowd of 32,351. They did improve and dominated the second half, but failed to find the net with only one effort on target and are now down to seventh with rivals Reading, Sheffield Wednesday and Fulham all winning. 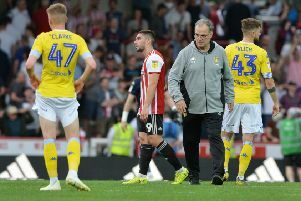 It is still in Leeds’ hands, however, on whether they reach the play-offs with Wednesday and Fulham due to meet on the last day of the season, but they may now need to win all three of their remaining games to be sure. Head coach Garry Monk selected an unchanged team from the one that grabbed a point at Newcastle and they started brightly enough with Kalvin Phillips’ dangerous low cross being well cut out by Wolves keeper Andy Lonergan. But their football became increasingly poor with hurried passes not finding their man and little creativity. It left them open to counter attacks, which this Wolves team are good at as they showed when a defensive mix-up led to Andreas Weimann going clean through only to be foiled by a good save from Rob Green. Wolves had another chance when a free-kick was not cleared and the ball fell to Richard Stearman, but another good save by Green kept United level. George Saville tried his luck with an effort from the edge of the box, but Kyle Bartley did well to block the goalbound shot. Striker Nouha Dicko was next to threaten as he latched onto a mistake by the strangely out of sorts Gaetano Berardi only to see his fizzing shot go just wide. Leeds finally did some attacking of their own and looked unlucky when penalty shouts fell on deaf ears after Bartley appeared to be bundled over while trying to get his head to a corner. Berardi hit a long range volley over then Pontus Jansson sent a header over from another corner. Jansson’s attempts to spark his side into life backfired in the 39th minute when his charge upfield came to nothing and Wolves turned defence into attack swiftly. With the defender out of position, Dicko timed his run perfectly to get on the end of a through ball and beat Bartley to the ball then beat Green with an early shot. Chris Wood had his first chance to add to his impressive tally just before the break when he controlled a long ball into the Wolves box, but his effort deflected behind with referee Jeremy Simpson overruling his linesman by giving a goal kick instead of the corner it looked like it should have been. Leeds looked to play the ball faster after the break and had reason to curse referee Simpson again when Wood’s attempted cross was stopped by the arm of Stearman, but again no penalty was forthcoming. Pressure mounted with Jansson heading wide at the back post from a Pablo Hernandez corner and Bartley heading over from a cross by Hernandez. A long range Lee Evans volley, easily dealt with by Green, was Wolves’ only effort on goal in the second half and they sat back and began to rely on time wasting tactics. Unlike Newcastle’s similar attempts last Friday, it worked as they managed successfully to break the game up. Leeds had several half-chances, however, with substitute Souleymane Doukara seeing a header tipped over by Lonergan and going on a great run down the left that almost resulted in an equaliser. Bartley had a strike well blocked and in the 89th minute Roofe’s looping header was cleared off the line. Into injury-time Wood got on the end of a cross at the far post, but could not direct his header on target and it was all over for United. It will be all over for them in the play-offs race unless they improve at Burton next Saturday. Leeds: Green, Ayling, Bartley, Jansson, Berardi (Taylor 63), Bridcutt (Sacko 56), Phillips, Roofe, Hernandez, Pedraza (Doukara 71), Wood. Wolves: Lonergan, Coady, Williamson, Stearman, Doherty, Edwards, Saiss, Marshall (Hause 85), Weimann, Saville (Evans 67), Dicko (Bodvarsson 67).